April, Raphand Mike are visting a local history museum and admiring the dinosaur relics, when one of the exhibit’s bones begin to swirl and converge – forming the bony but familiar face of Savanti Romero (from Teenage Mutant Ninja Turtles #8)! Savanti explains that he’s using sorcery to communicate through the aeons, and that he plans to desroy the Turtles – but he offers them a chance to save themselves – if they’ll meet him at the “Ring of Fire.” The Turtles are confused as to what this means, but before any explanation is offered, the bones collapse into a heap on the floor. Later, at April’s apartment, the TMNT decide they’ll have to travel back to the Cretaceous Era to fight Savanti – obviously banning him to the distant past wasn’t good enough. Don explains that the Ring of Fire was a volcanic chain that includes Japan – but their problem will be finding the correct date and time to meet Romero there. On cue, the air is disturbed by cosmic energy and Renet appears. She explains that Lord Simultaneous has sent her to help the TMNT against Savanti as her “final exam” to graduate from being an Apprentice Timestress to getting into the Temporal Infraction Explicator First Grade. After a brief and confusing talk about the anomalies of time travel, the TMNT decide to go with Renet to the Cretaceous Era to battle Savanti Romero. April stays behind to make Master Splinter some sashimi (and because she has no interest in fighting wizards or traveling through time). Renet takes the guys back to the land that time forgot. The guys admre the dinosaurs and scenery, but are soon set upon by a pack of Deinonychus. Before a fight breaks out, Savanti Romero appears on the back of Tyrannosaur that takes a bite at Renet – but Leo saves her. 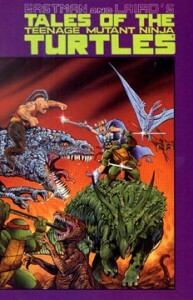 A battle erupts between Turtle, sorceror and dinosaur. Leo “pilots” a Triceratops and it kills Romero’s T-Rex. Savanti hops aboard a pterodactyl and makes his escape – but before departing, the beast swoops down and grabs Renet! The TMNT hack their way through the jungle in pursuit, and eventually come to a lake. A huge bone structure has been magically assembled by Romero, forming a ring at its peak. Savanti is there with Renet, who is tied inside the circular opening at the top. The Turtles scale the bone architecture and face off with Romero. Savanti gloats that he already has Renet and the Time Sceptre and tells the Turtles to surrender – the guys, of course, refuse. Romero then goes on to explain that in ten minutes a bolt of cosmic energy is going to shred the atmosphere above them and pass through the Sceptre and the circular hole in the bone structure (incinerating Renet in the process). The blast will open a hole in the earth below that will unleash the molten core of the planet and result in the volcanic eruption of the entire Ring of Fire. A process that will slow the Earth’s revolution around the sun ever so slightly, but enough to change the planet’s course through space. This slight change will cause the gigantic, dinosuar-killing meteor that slammed into the planet to miss entirely – thus altering the future of the world and ensuring that the rise of mammals (and Mutant Turtles) will never happen. Savanti then uses his magic to build himself a bone exo-skeleton. Once he’s super-sized, Romero attacks the TMNT. While Raph, Mike and Don battle Savanti, Leo frees Renet and then goes after the Sceptre. Savanti spots Leo and chases after him, forcing Leonardo to give up his attempt to retrieve the rod. Romero lovingly grasps the Time Sceptre, just as the bolt of cosmic energy crashes down from the heavens. The force of the bolt fries Savanti and the rod. The charred body of the sorceror falls into the sea far below, with the Sceptre in his paw. With the wizard apparently dead, the sorcery that held the bone tower together gives way and it begins to fall apart – thus the wizard’s plan to alter the future ultimately fails. Our heroes make their escape in the nick of time, as the structure collapses into the ocean! The big problem now – without the Time Scpetre, the TMNT and Renet are trapped in prehistoric times! Three months later, Raph, Renet, Leo and Don return to their camp with a gigantic fish to fry. Mike guts the fish and inside they find the Time Sceptre! After they cook up the fish, the heroes can finally return to their own home – and time!